Healthy Christmas Trifle | Gluten Free and Sugar Free. Healthy Christmas Trifle Recipe | Gluten Free and Sugar Free. 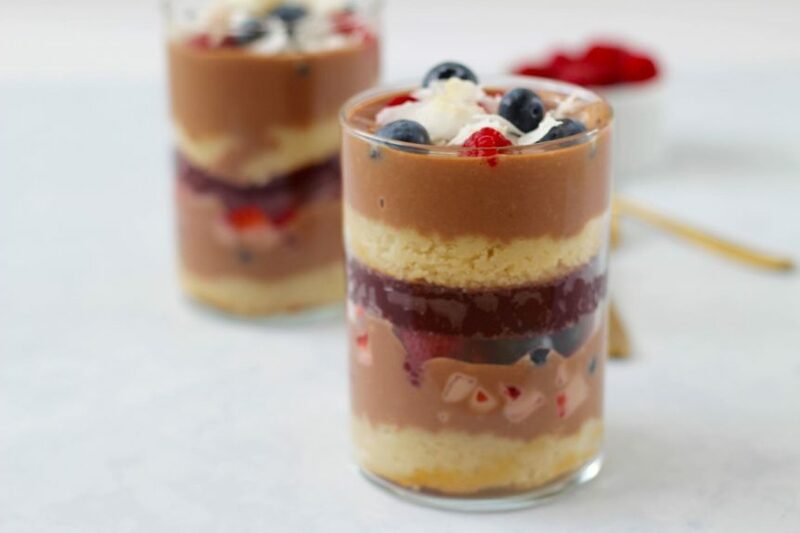 This healthy Christmas trifle recipe is an epic extra merry collaboration with our blog partner, Gelpro, Gelatin Australia. We only collab with people and brands we love and woah do we love our gelatin! This healthy sweet treat is the perfect recipe to make your Christmas dessert buffet extra healthy, delish and epic! Yay for healthy Christmas trifle! Made with no sugar, no gluten, no grains BUT it gets even better! We’ve added the amazingness of gelatin powder… we used the orange container from Gelpro. It’s called Peptipro Australian Beef Gelatin and it says it’s the ‘gelatin that gels together’. So you know this is the one to use to make the jiggly jelly! Yes, it is real proper jelly. It tastes good and it really is healing goodness in a powder… which turns into jelly. There’s no sugar, no artificial yuck stuff, no lactose, no carbs. Only good stuff in the gelatin! We’ve used gelatin powder in a bunch of recipes and we add it to our smoothie every day (you can use the Gelpro blue coloured container for dissolving in liquids). We’ve talked about the health benefits of gelatin before but just in case you need some reminding here goes again! Why is Gelatin Powder so Good for Me? It’s packed with protein, this variety is 88% protein so it’s good for muscle growth and recovery. It’s filled with collagen so it’s your perfect skin regime… that you eat! It tightens loose skin, helps cellulite, makes skin tone smoother and even reduces and prevents wrinkles (um… magical!). It promotes and improves hair and nail growth/condition. Seriously, our nails have never been so strong and Emma’s don’t stop growing. Helps digestion and promotes gut health. It tastes all kinds of good, we’re talking party in mouth good. Christmas time = party time = good time. It’s a sweet treat that actually has health benefits (reminder: this does not mean you can eat the whole thing on Christmas day, ok!). It will turn your Christmas dessert buffet into an extra Merry, epic Christmas dessert buffet. Did you read the above list? Find out more about Gelatin and Gelpro over HERE. Seriously, if gelatin isn’t on your supp list… it needs to be. We’d LOVE to see your Christmas dessert buffets this year so make sure you share a pic with us! We’ve got more epic recipes coming to you, like… fruit mince pies and Christmas pudding! EEE! So excited! p.s it looks like a SUPER long recipe… but it’s worth it! PROMISE! Start with the cake! Preheat oven to 180°C (355°F) and line a 20 cm (8 inch) springform cake tin with baking paper. In a large bowl combine the almond meal, coconut flour and baking powder. In a blender or mix master, whiz the coconut oil and rice malt syrup together. Add the eggs, vanilla, coconut milk and mix well. (Don't worry if it looks a little 'curdled'). Transfer into the lined tin and bake for 40 minutes or until lightly brown. While the cake cooks, make your jelly! In a small sauce pan combine the tea and rice malt syrup. Place the sauce pan onto medium heat and continuously stir for 5 minutes until smooth. Pour the mix into a 20 cm (8 inch) square large silicone mold or lined slice tin. While this is happening get onto the choccy cream and slice your berries! The choccy cream is easy, whiz everything in your blender until super smooth! Now it's time to layer everything up! We did: cake, choc cream, fruit, jelly, cake, cream, fruit, topped with coconut flakes! But you really can get creative here! Ours are really neat (we cut exact circles around the glass to do this) but you could chop up the cake and jelly into cubes and go for the Merry messy trifle look! You choose! Use any fruit in your layers! Mango would be DELISH! AND save any extra cake/cream/jelly for super delish snack attack moments!